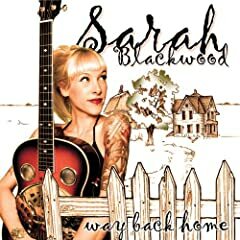 On Way Back Home, Sarah Blackwood delivers a solid set of neo-traditional country songs. Her slightly worn - smokey, not scratchy - voice is perfect for the dark and heartbroken tone of the album. The songs are mostly stripped down to just her voice and a strummed acoustic guitar. Although the straight forward lyrics about the crap boyfriends dragged her through, recall classic country, some of the phrasing and perspective - direct, not overly sentimental - seem a little punk, which makes sense since she also fronts a horrorbilly punk band, the Creepshow. It's not quite tear in your beer music - her voice is strong and her outlook reflective, but if the liner notes are too be believed, these are based on real-life tough times. At points it feels a little too reigned in. Some of the songs seem like they could use an infusion of energy, perhaps borrowing a Creepshow riff or two. Regardless, it's a solid album and it'll probably make you want to check her other band too.